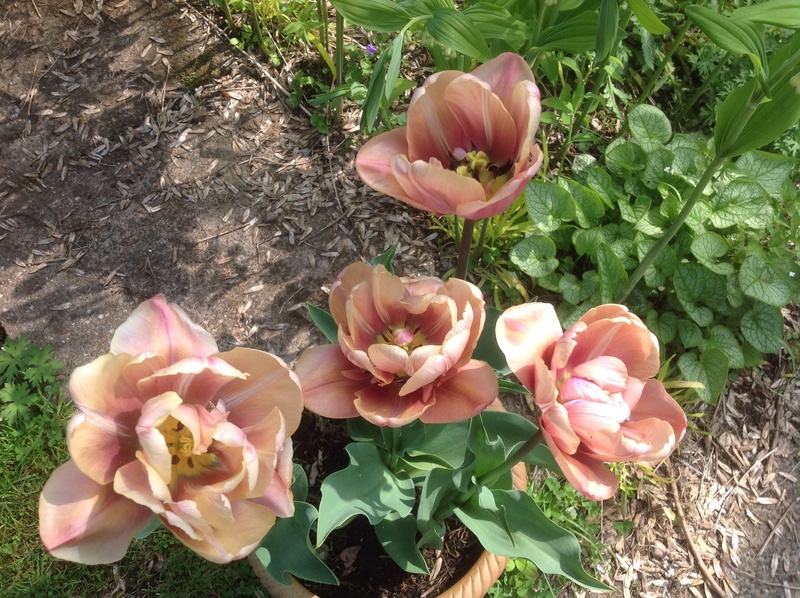 This entry was posted in Uncategorized and tagged tulips, Wordless Wednesday on April 30, 2014 by thelonggardenpath. My cunning plan – An apology! 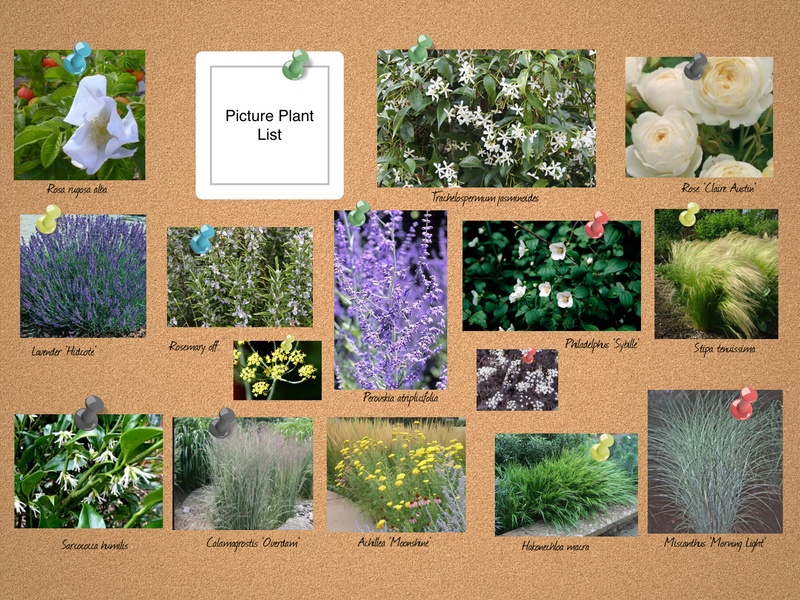 It has just come to me, that I didn’t post the Picture Plant List that I created for the plan. (This was intended to give the Commitee some idea of the plants I was considering). After all, this is, most likely, the bit that interests us all. So I must put that right! The suggested plants don’t all appear in the final plant list, partly due to availability, and partly, how the planting plan developed. 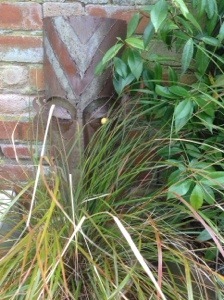 Most notably, I couldn’t fit the Perovskia into the planting plan. And this is just a sample – a taster, if you like! Many more plants were added to the final list. This entry was posted in Garden Design and tagged Garden design, Garden scent, grasses, Prairie-style planting, Roses, Scented shrubs on April 29, 2014 by thelonggardenpath. My cunning plan – The story so far! 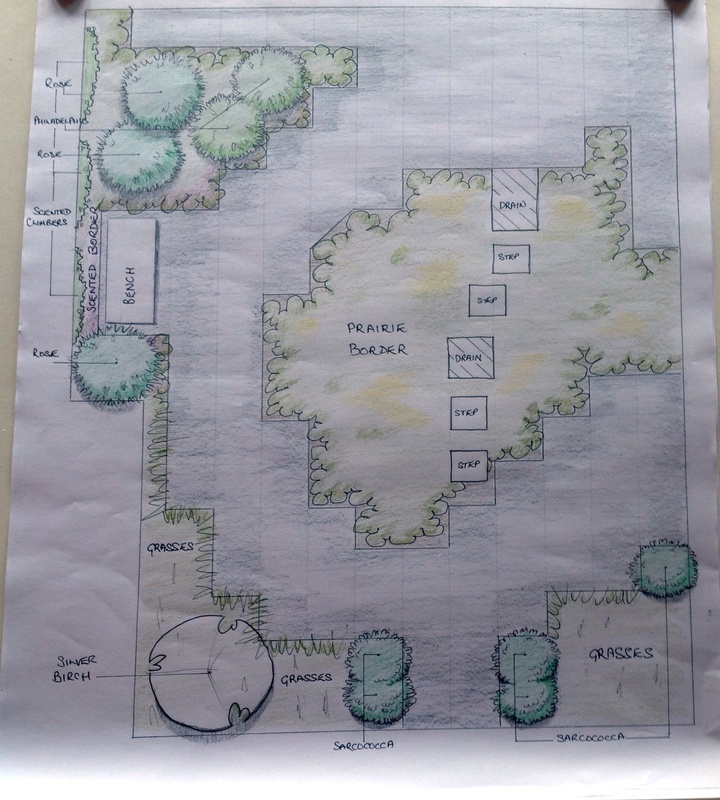 I have been busy working on a voluntary project, to design a garden for a local Health Centre. From these “Before” pictures, you can see what I have had to contend with! “Tombstone City” is how the Chairman of the Patient Commitee introduced it! If you read my first post on the project, you will know the ideas I was playing with – A “Healing Garden”, with medicinal herbs and plants, A “Memory Garden” with roses and plants donated in memory of loved ones, and a “Serene Garden”, designed as a calm, relaxing space. I opted for the latter. On to my task! 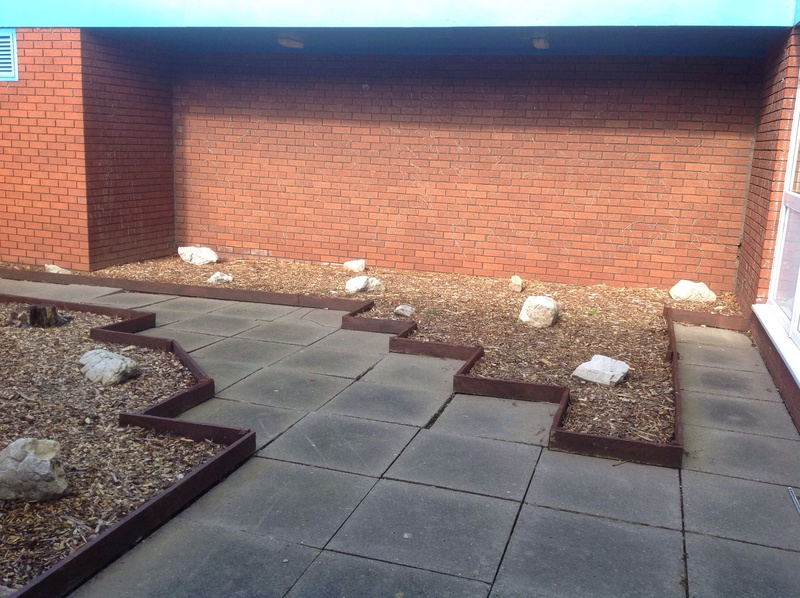 I planned to solve the drain cover problem, by incorporating them into a path of stepping stones through Prairie-style planting, to disguise them to some extent. 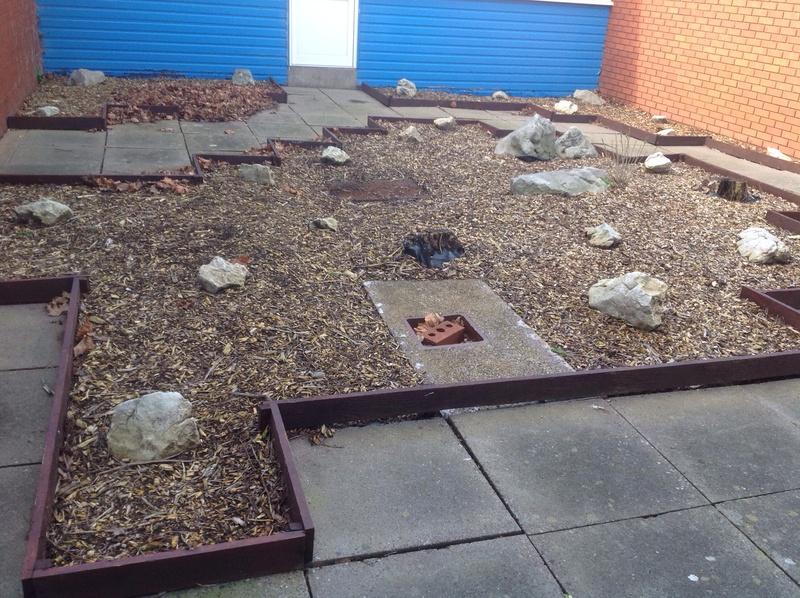 All the boulders would be recycled and employed in the new scheme. I would use lots of grasses, for their calming movement and sound. Scent would also be an important feature. The colour scheme I chose was to be white, for its cool, calming effect, and yellow, as it is cheerful and uplifting. The second photo shows a perfect spot for a seating area – sheltered, backed by a brick wall, and in full sun. This would be the white, scented garden, with roses and lavender, backed by the beautiful, white climber Trachelospermum. Oh, and, of course, a bench! The main bed in first photo was to have the prairie planting of grasses and mainly yellow flowers, with hints of blue/purple for contrast and depth. 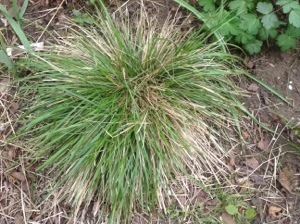 The smaller beds would have mass planting of grasses. All chosen to grow easily, with the minimum of maintenance. With my ideas formed, it was time to put pencil to paper. 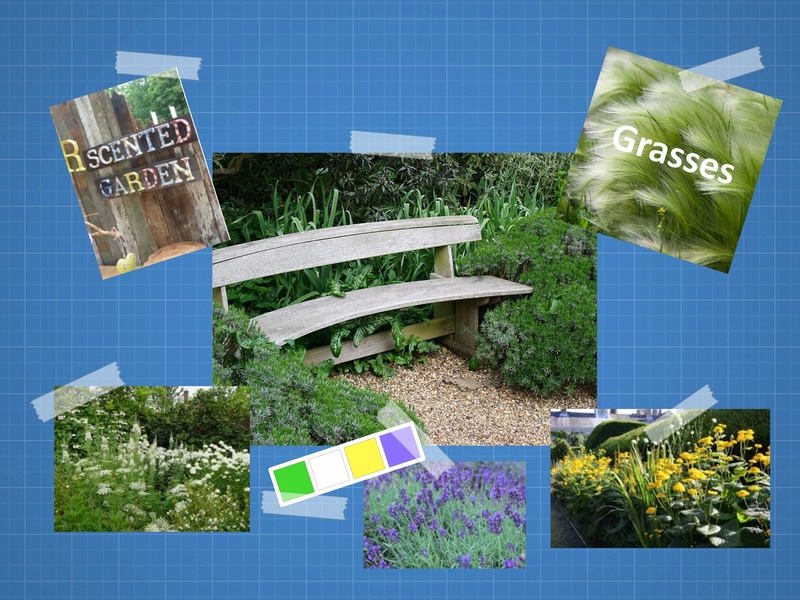 First, was to create a Mood Board, to try to convey to the Commitee, the essence of the garden, which is what you see at the top of this post. I did with it a written outline of what I planned, along with a picture Plant List, to give some idea of the planting I was considering. So then came the main Outline plan. Once happy with that, I moved on to the Planting plan, complete with plant list, plant availability, costings, (which incidentally, was on target!) and, to round it off, a care plan. 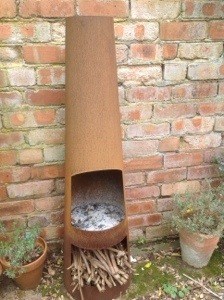 I added into this the possible next step, of adding bulbs to the scheme in autumn, suggesting that these could be donated by staff/ patients, with the aim of encouraging their participation in the garden. This has all now been submitted. The next Commitee meeting is at the start of May, so now it’s the waiting game! This entry was posted in Garden Design and tagged Garden design, Garden scent, grasses, Prairie-style planting, Roses on April 27, 2014 by thelonggardenpath. My not so grown- up son, still has to have his childhood Easter rituals, of decorating and rolling hard boiled eggs, and an Easter egg hunt. 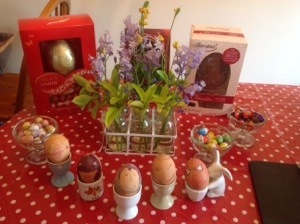 As you can see, the eggs have already been decorated, ready for rolling. The theme (apart from my traditional clown – I can’t draw anything else!) was Superheroes. 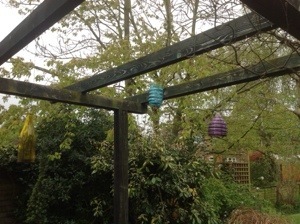 Now for the Egg hunt – complete with glimpses of our garden! The theme was Song Titles – they had to use the titles to track down where the eggs were! Can you spot them? I hadn’t realised how well I’d hidden them! And if you can guess the song titles, I’ll be even more amazed! This entry was posted in Uncategorized and tagged Easter eggs on April 20, 2014 by thelonggardenpath. …. Or at least it was! How short-lived! It was only 4 days from idea to photo! I was revelling in all the white blooms that were out in the garden, and thought it might make a good post. Never mind! 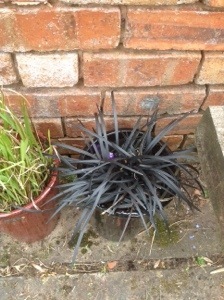 I can still show you my blooms but the initial impact has gone. Let me show you first, two of our inherited shrubs. They are incorporated in our “Scented Shrub” border, even though they don’t meet that criteria, but they are still garden worthy. 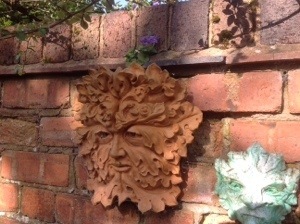 I just grow scented climbers through them to satisfy my sense of detail. 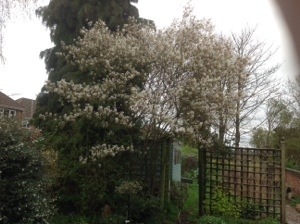 I identified this as an Amelanchier. It is a beautiful shrub that we both love. 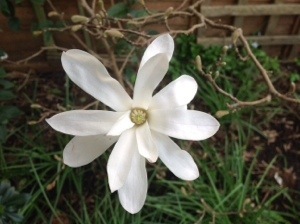 It has this lovely, white blossom in spring, quickly followed by fresh coppery leaf growth. It’s quiet over the summer but in autumn, it’s an explosion of colour as the leaves turn red. And all in full view of the kitchen window! 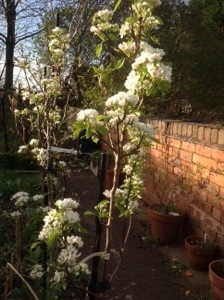 Our pair of unknown Cherry trees and they do give fruit too – which the birds seem to love! Stunning against a blue sky! Now onto my scented shrubs! My Osmanthus is covered in clusters of small, white flowers which pump out a delicious scent over a large area. 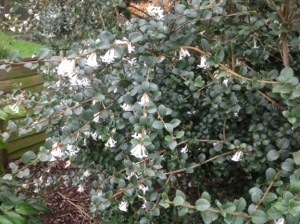 The rest of the time, it looks good, with small, dark green leaves, forming a rounded, evergreen shrub. It’s almost the perfect flower! Star-like, as it’s name suggests. 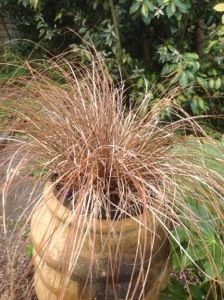 I replanted this from a pot last autumn, to hopefully give it better conditions. 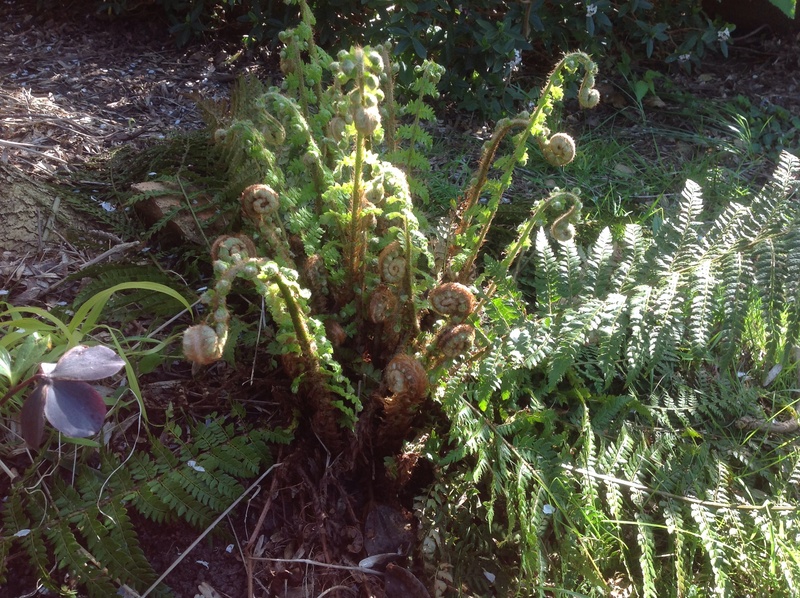 It’s not done too badly, although still, as in previous years, many of the furry buds don’t bring forth flowers. I must investigate further. I am allowing myself a bit of licence by including white with a hint of pink! 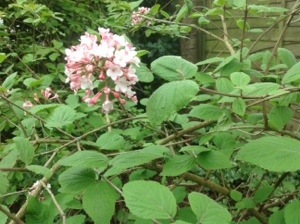 The viburnum’s snowball shaped blooms look just as lovely while developing, with clusters of ruby buds. 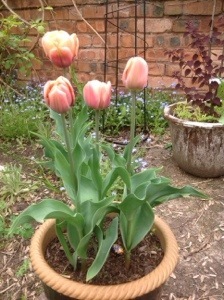 And once they open the scent is just as lovely – possibly clove, similar to pinks. And in the scent stakes, Daphne takes some beating. 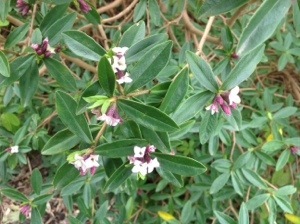 This variety, tangutica, is an evergreen shrub about 3-4 ft high, with the typical Daphne flowers. 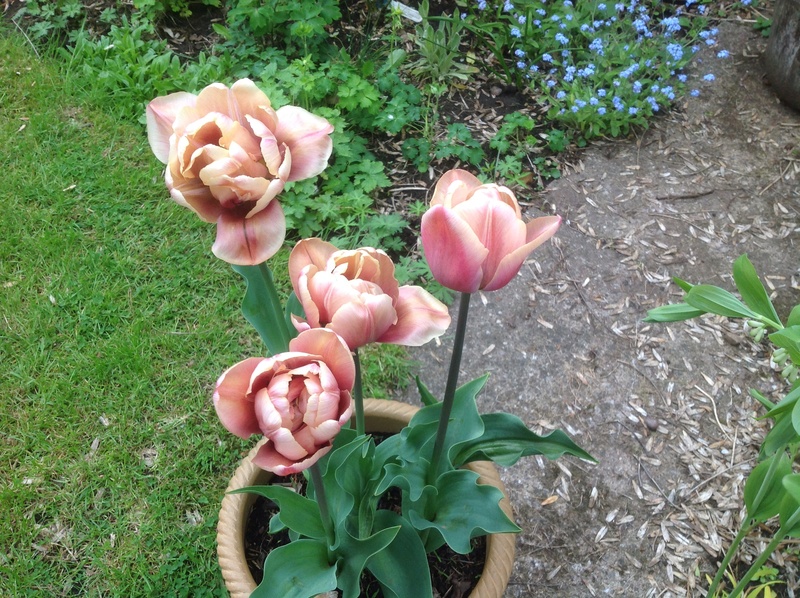 It often repeat flowers throughout the season – an added bonus! Now I want to introduce you to our “Mini Orchard”. 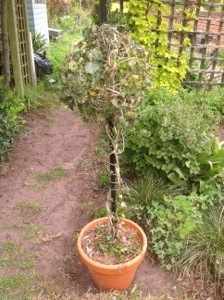 It consists of 5 cordon fruit trees, lining one of the “Allotment” paths. We have 2 pears – “Doyenne du Comice” and “Conference” – a “Scrumptious” apple tree – a “Victoria” plum – and a cherry, “Summer Sun”. Last year was its first full year and produced a fair amount of fruit. 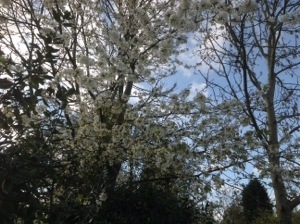 It, too, is bursting forth with white blossoms, and is looking good for another possible good harvest – fingers x’d! 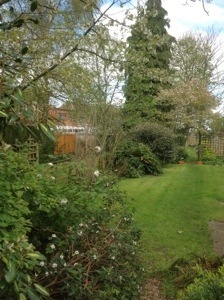 And, in addition, we have several white-flowered spring flowers doing their bit as well, but I must stop somewhere! 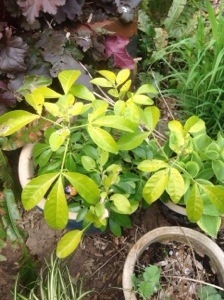 This entry was posted in The Scented Path and tagged amelanchier, cherry, Daphne, fruit, Magnolia, Orchard, Osmanthus, Scented shrubs, Viburnum, White on April 19, 2014 by thelonggardenpath.